Hello August! This month we’re celebrating Alfred Hitchcock’s birth month by giving our readers some great ways to celebrate. His actual birthday is the 13th, but why only celebrate on one day when we can celebrate all month long. Our first post is from our craft wizard Lorraine Masonheimer. Lorraine will show us how to host an Alfred Hitchcock dinner and movie night for The Birds, a Hitchcock classic. Come on back this Thursday when Lorraine will start her series on Hitchcock inspired greeting cards that you can make at home. The birds, real and animated, were attached to the character’s clothes by elastic bands so they couldn’t fly away. Tippi Hedren suffered cuts on her face during filming, a number of children fell when running from the school and it took days to film. Tippi’s bedroom attack scene at the end of the film took seven days to shoot and left Hedren in a hospital due to emotional and physical exhaustion. It was one of Hitchcock’s most difficult shoots. Nearly 3,200 birds were trained for the movie and Hitchcock found that ravens were the cleverest and seagulls the most vicious. The film continues to fascinate audiences worldwide. I selected this film because of its lasting impact on a young girl. 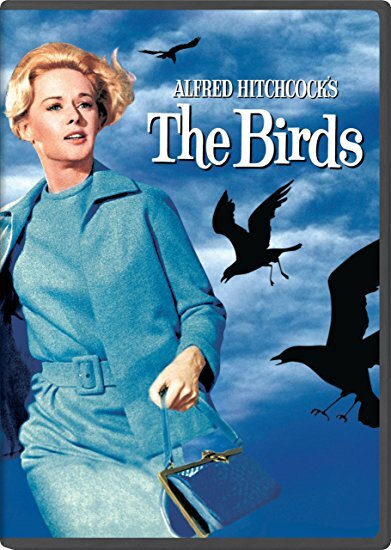 Today, when I see large flocks of black birds, I immediately think of this movie and the possibility of “what if”—quite a statement for a 1952 book and a 1963 movie. I also enjoy Hitchcock’s flair for enhancing the audience’s experience. At the London premiere, after watching the film, the audience left the theater with sounds of screeching and flapping birds hidden in the trees. Hence, the inspiration for Dinner and a Movie Watch Party! 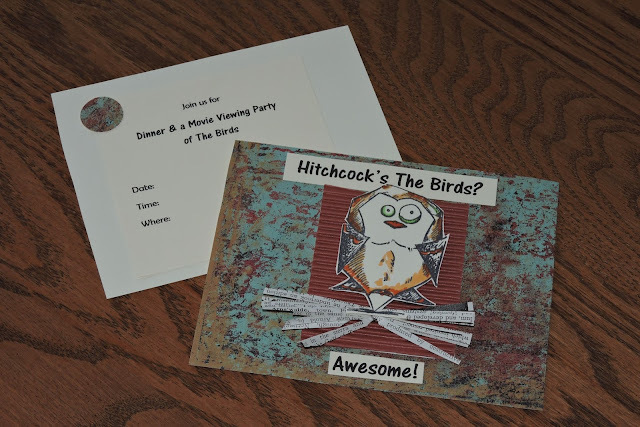 Create and USPS mail a bird-themed invitation sure to catch the attention of family and friends. I used Tim Holtz’s Bird Crazy stamp with charcoal ink to give the card impact and personality. I centered it on a 4 ¼” x 5 ½” cardstock, glued it to corrugated paper on top of a rust-like textured paper. Shred a book page to create a nest. Grab your guests from the moment they approach your door. 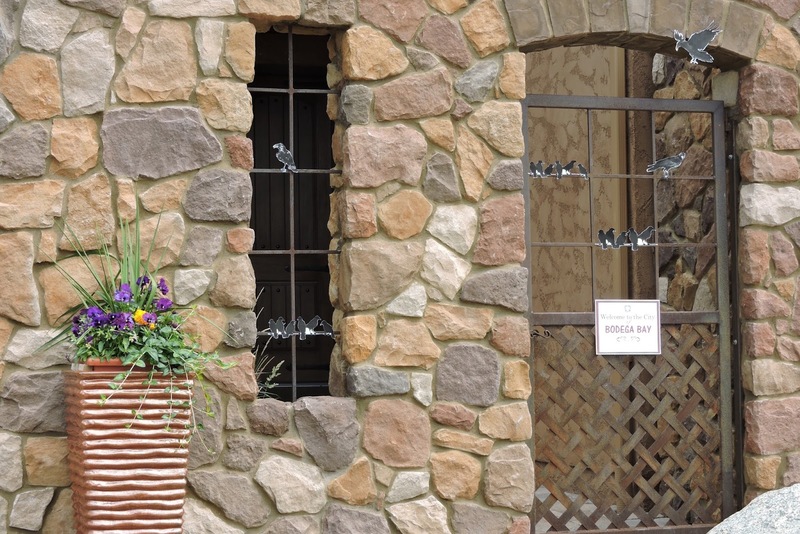 If you have a gate, tape the several birds along the top or use a square tomato cage placed by the sidewalk closest to the door. Craft stores may have cardboard birds for purchase or download free bird art from the internet and cut them out. Place a sign “Welcome to the Town of Bodega Bay” on your front gate. Draw and cut out a large outline of Hitchcock and glue to your front door. 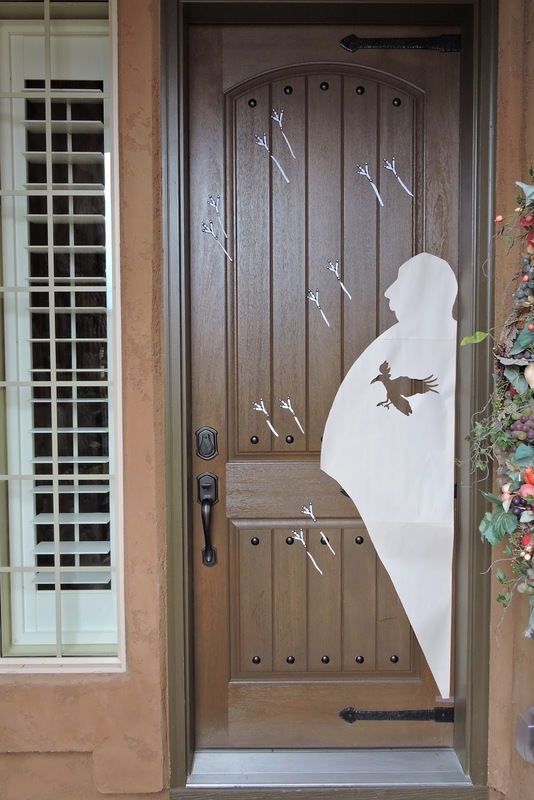 Include a few bird claw prints and strips of paper to represent the birds attacking the door. 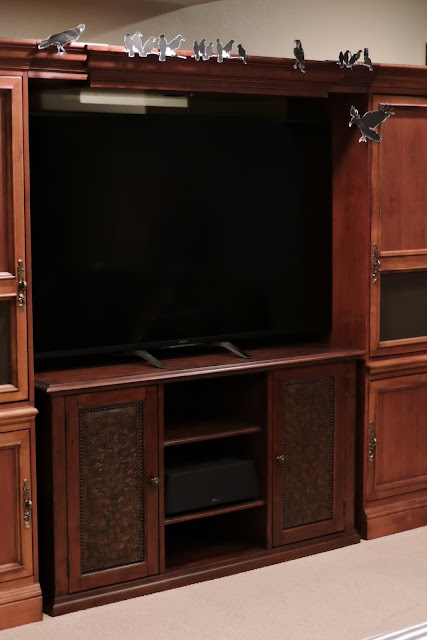 Lastly, place birds around the TV so they lurk throughout the movie. Start the evening off with a movie-themed dinner that’s easy to eat around the TV. 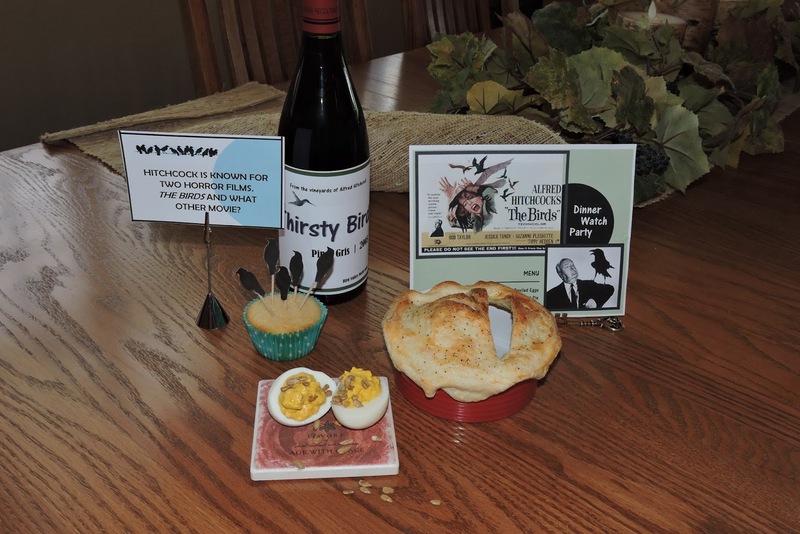 Pop open a bottle of wine, perhaps from the Little Raven Vineyards, a RavenBeer Lager or create your own label and glue to the bottle. The menu starts with Deviled Eggs as an appetizer, moves into It’s for The Birds Pot Pie and wraps up with bird topped Lemon Buttermilk Cupcakes (see recipes below). Sprinkle a few black feathers around the food and drink table for effect. #1 WHICH IS BETTER: COOKIE DOUGH OR BAKED COOKIES? #4 WHICH GAME OF THRONES CHARACTER WOULD YOU LIKE TO BE? #6 WHAT HAPPENED TO TIPPI HEDREN AFTER THE SCENE WAS SHOT WHERE SHE WAS RAVAGED IN A BEDROOM BY THE BIRDS? Answer: She had a mental breakdown and was hospitalized for a week. Production was shut down and near the end of the film when Mitch carried Melanie down the stairs, they used a stand-in as Tippi was still in the hospital. #7 WHAT MAJOR GAFFE WAS IN THE MOVIE? Answer: A shopkeeper had a New England accent and Bodega Bay is in California. Mix the ingredients together and adjust to taste. Spoon the mixture into the egg white halves and serve cold. If desired, sprinkle the top with sunflower seeds—the birds love ‘em! Preheat oven to 350 degrees. Cook onion & fennel in butter for 10 minutes until onion is translucent. Blanch potatoes in boiling water for 2 minutes. Remove potatoes & blanch carrots & asparagus in potato water for 2 minutes. Remove veggies. Add 1 cup of chicken broth to the onion/butter mixture. Cook until thick (not too soupy). Add remaining ingredients to pan & stir in veggies & chicken. Place mixture into oven safe bowls or mugs. Cut pie pastry 1” larger than the container. Beat 1 egg & wash the top of the container & press to seal. Wash top of pastry with egg and sprinkle with salt and pepper. In keeping with the theme, cut a bird claw print into the pastry top and bake for 1 hour. Preheat oven to 350 degrees. Line a 12 cup muffin pan with paper liners. In the bowl of a stand mixer, beat butter and sugar at medium speed until fluffy, 3 to 4 minutes. Add egg, mixing well. Beat in vanilla, lemon zest, and juice. In a medium bowl, whisk together flour, baking soda, and salt. Gradually add flour mixture to butter mixture alternately with buttermilk, beginning and ending with the flour. Beat just until combined after each addition. Pour batter into muffin cups about 2/3 full. Bake 18 minutes or until wooden pick comes out clean. Cool, insert gummy worms into each cupcake and top with the glaze. Allow glaze to harden for 30 minutes before serving. Optional: Place 3-5 raven cupcake toppers into each cupcake. Note: Bird cupcake toppers are available online or you can make your own using black construction paper, cut out several bird shapes and glue them to the toothpick with a bird on each side. Whisk together in a small bowl until combined. Use immediately to frost the cupcakes. Let glaze harden for 30 minutes. If you have space, rent a projector, string a king-size sheet and show the movie outside while birds fly overhead. Take a few old sheets, cut slits in it as if attacked by birds and hang as curtains next to the sheet/screen. You’ll create a memory your family and friends will not soon forget. What a darling idea! I love the silhouette on the front door. Great post!